The 15th Battalion, Canadian Expeditionary Force was a unit raised for service in the First World War. The battalion was composed of recruits from the Toronto area and was initially commanded by Lieutenant-Colonel J.A. Currie. The unit embarked for overseas from Quebec City on 3 October 1914 aboard S.S. Megantic and disembarked in the U.K. on 14 October 1914 with a strength of 46 officers, 1109 other ranks. The unit moved to France on 14 February 1915 as a battalion of the 3rd Canadian Infantry Brigade, a component of the (1st) Canadian Division. The unit was eventually reinforced by the 5th Canadian Reserve Battalion. Service: Component of the 3rd Infantry Brigade, 1st Canadian Division in France and Flanders. The battalion was affiliated with the 92nd and 134th Battalions, and after the war officially perpetuated by The 48th Highlanders of Canada, to whom they turned their colours over in 1919. In 1914, there had been little time to adopt distinctive unit badges for the hastily assembled battalions of the Canadian Expeditionary Force. 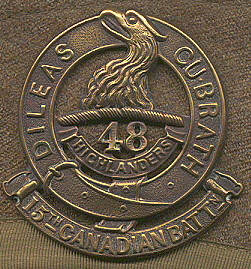 As many battalions were drawn from men from several of the pre-war Militia regiments, there was a desire to avoid using existing badges and forming associations with those existing units, in favour of creating new identities - the General Officer Commanding the 1st Canadian Contingent (later 1st Canadian Division) is quoted as saying sometime in October or November of 1914 "there must be distinctive badges for each unit. "4 Until unit badges were approved and issued, a mixture of pre-war Militia badges and maple-leaf pattern General Service badges were seen. Metal cap and collar badges were also worn on service dress. In mid-1916, cloth "battle-patches" were added to the sleeves of the Service Dress and greatcoat. The 1st Division was distinguished by a red rectangle, 3 inches wide by 2 inches tall, worn on each upper arm. The 15th Battalion was further distinguished by a blue triangle worn above the rectangle, the blue indicating the 3rd Brigade, and the triangle indicating the third-senior battalion in the brigade. More information on formation patches can be found in the article on the organization of the division. Guide to Sources, p.80, (copy in RG24, vol. 1258, file HQ 593-2-1, pt. 1).